Last night I ran my final run in Central Park. Toward the end, I was struck by a sudden urge to sprint to the northern tip of the reservoir and revel in the midtown skyline. I have stared at the skyline many times before, of course, but final occasions afford some unexpected ruminations. 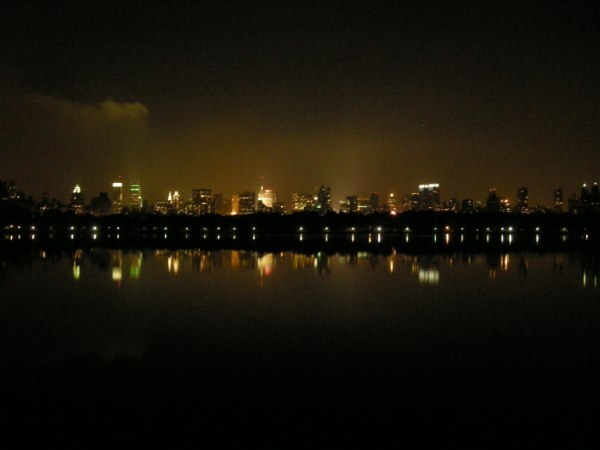 I peered at the skyline, the reflection of the skyline, and my memories of my last big departure: Dar es Salaam. I had declared the city of Dar es Salaam—the city itself—somewhat unpleasant: flat, hot, dirty, stressful, and sometimes dangerous. My departure last year was painful exclusively because of the people I was leaving: it had nothing to do with the city itself. I have neglected my blog and will continue to do so for at least another week; in the meantime, a former roommate has written a fabulous piece for the New York Times about my current apartment's view: Parallel Lives. My office in SoHo is similarly proximate to parallel workplaces: should I break the unwritten rule, I would be spying upon finance companies, design firms, Internet start-ups, and laser light show producers, all 12 feet away. At least my bedroom window faces diagonally, so at night my view is an unthreatening brick wall. A five-foot-tall transvestite, dressed in drag, walks up to me at the Posta Mpya public transit hub late at night in Dar es Salaam, happily yammering words I cannot understand. I smile and shrug, and eventually he moves on to his next comic victim, never missing a beat in his monologue. Ni mchizi yangu, a passer-by jokes with me: a Swahili pun, in this context straddling the line between, this is my buddy and, this is a crazy person. Out of the spotlight, I am free to look around: I notice that a crowd is laughing at my accoster. What does gambling mean to you? To me, gambling is a lark. Last night I won sixty cents on a horse named Pacific Flora: my tactic was to select the horse with the slowest-sounding name, and after searching the big book of small numbers in vain for a name along the lines of Bro-Can Leg, I decided seafaring algae might be comically slow as well. Pacific Flora somehow managed to evolve its way to first place. Then I saw the slot machines. These opinions are all mine.